I went to QFC early in the week because we were out of fruit and needed milk. I spent on $28.52. I stopped at Fred Meyer to pick up cheese and bananas because I was leaving town and wanted DH to have easy food for the kids. I spent $9.92. The beef was delivered this week, too. We paid $2.89/lb and got a whole lot of meat! I don't know exactly how much it weighs because the 171 pounds on my receipt is likely before butchering and lots of weight is lost in the processing and packaging. I can't find my receipt and the check hasn't cleared yet, but it was $496ish. 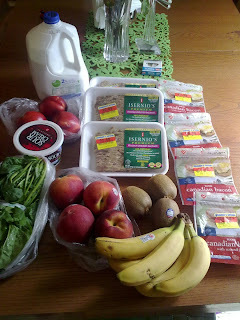 One more quick trip to the store as I was leaving town and needed to leave a few items for the meals I planned for the weekend. I spent $3.19. Our milk delivery was $11.16 and I bought eggs for $4.00.